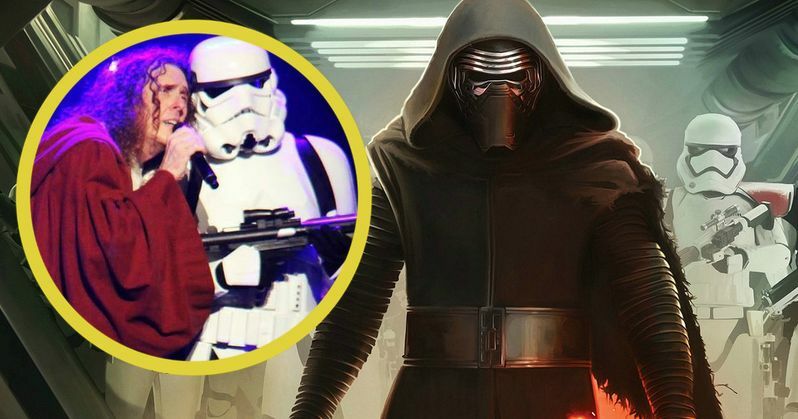 Why Didn't 'Weird Al' Do a Star Wars: The Force Awakens Song Parody? This past December, everyone on planet earth caught Star Wars: The Force Awakens fever. Except for one man. And that man was 'Weird Al' Yankovic! Many fans expected the King of Parody to unleash a new Star Wars: The Force Awakens themed song. But he didn't deliver on that 'assumed' promise. Though, the singer, songwriter and comedian has a perfectly good reason for jettisoning the idea. Sure, 'Weird Al' Yankovic felt the impulse to create a song based on the new characters and action seen on screen in Star Wars: The Force Awakens. But he claims it would have been a pull to the Darkside. And just because fan demand is high, doesn't mean he should give into their whims. In a recent interview with Rolling Stone, The Weird One explained why we're not getting a Force Awakens theme song anytime soon. It's a thought that crossed my mind, certainly, and everybody on my Twitter feed was like, "Oh! You have to do another Star Wars song." In fact, a few years ago I teased, "You know, I do a Star Wars song every 20 years like clockwork. It could be about that time." But I looked at it practically. I've already got two Star Wars songs in my set, both of which I pretty much have to play because of fan demand. If I had a third Star Wars song, it just sort of becomes the Star Wars show. So for that reason alone, I kind of feel like I probably should just keep it at two." Don't call him down for the count quite yet, though. It's possible that he may rethink his decision after he finishes up his Mandatory Tour this summer. Though, he may wait until Star Wars: Episode VIII and Star Wars: Episode IX are released before he brings Rey, Finn and Kylo Ren into his stage repertoire. Star Wars: The Force Awakens was far too secretive to be able to do it justice in a song before it was released this December. 'Weird Al' Yankovic's first Star Wars themed song was Yoda, released in 1985. It arrived just a few years after the first trilogy closed out, and is a parody of "Lola" by The Kinks. His second Star Wars song came in 1999. "The Saga Begins" sums up everything that happens in Star Wars: Episode I - The Phantom Menace, and arrived while the first prequel was still making big bucks at the box office. It was a parody of "American Pie" by Don McLean. We've included the video for you here. Who knows if 'Weird Al' Yankovic will ever decided to tread this ground again. We think he might!